Last week, my pals and I spent a long weekend in Barcelona visiting the awesome Primavera Sound music festival. The rather nocturnal nature of the event (bands playing from 18.00 to 04.00) gave us plenty of time during the day to sleep on the beach drink excessively visit some of the beautiful sights of one of Europe’s most vibrant cities. So what did we see? Gaudí’s majestic Sagrada Família? The magnificent Camp Nou, home of FC Barcelona? Nope, we went to a science museum. Nerds: that’s how we roll. CosmoCaixa, Barcelona’s science museum, is amazing and well worth checking out if you’ve a spare few hours on holiday. It has more hands-on exhibits than you can shake a stick at and comes complete with an indoor rainforest. Beat that, London Science Museum. But what’s it got to do with the Microbelog? Well, the permanent exhibits feature a surprising amount of microbiology, including lots of microscopes to look down and several Winogradsky columns. 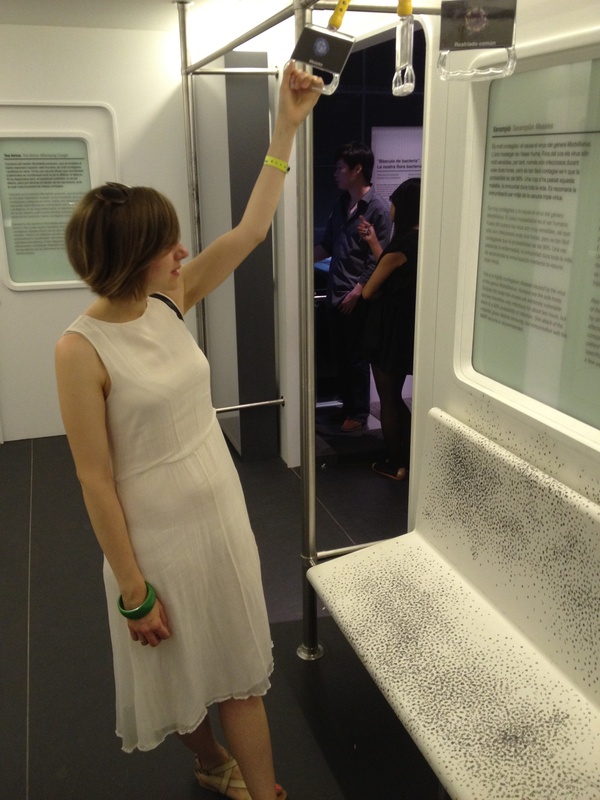 More exciting for me was the temporary exhibition Epidèmia, a look at serious human pathogens. It was a really big space, full of individual displays detailing important diseases, each featuring historical props, pictures or gory waxworks showing the symptoms of each disease. You can see the tuberculosis section (complete with diseased foot) below. It might look like a huge amount of text, but it’s split into Catalan, Spanish and English. The information was super clear, and plenty of facts were available. It wasn’t all information boards; there were plenty of other interesting bits too. I’ve managed to miss every exhibition of Luke Jerram’s glass microbiology sculptures, so I was delighted to see several of them were present. Pictured here is an E. coli bacterium. They’re all quite beautiful, but I have no idea how he gets the genetic material inside the sculptures (if any glassblowers are reading this, please leave a comment below). There was also some examples how microbes affect us in our day-to-day lives. In one exhibit, you could find out the mass of bacteria within you, and which species live in or on different parts of your body. Here’s AMRC’s Becky Purvis being surprised that 1.25 kg of her is actually microbes. This is quite timely, given that the human microbiome was published last week. We also learnt how a sneeze can quickly travel the length of a train carriage and what it can contain. As someone who is repulsed by people sneezing on public transport (please, cover your mouths), I found the loud sound effect, complete with accompanying burst of air, very distressing. Here’s Becky holding onto a handle with a picture of a measles virus. Thankfully it’s a pretty unstable virus and most people are immunised against it, although outbreaks still happen. This has all come across a little bit like a ‘what I did on my holidays’ school essay, but I think it’s great to see so much biology generally, and microbiology specifically, in a science museum. Typically, these spaces tend to be dominated by physics exhibits – it’s easier to demonstrate a pendulum than a type III secretion system – so I hope this museum acts as a template for others to follow. Special thanks go to the good folk at AMRC, CaSE, Cancer Research UK and Digital Science for enduring my excitement.